Some employers may consider reducing employees’ hours to get around the “full-time” label and accompanying Affordable Care Act requirements. Such activity might prompt legal challenges from affected employees. 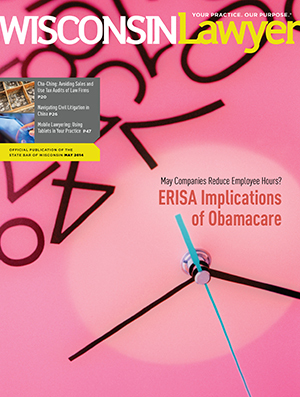 Despite surface inconsistencies, the ACA and ERISA’s protection of employee benefits can be harmonized by employers seeking to avoid being covered by the ACA’s employer mandate. Many items of tangible personal property and certain services purchased by law firms are taxable. A firm’s failure to evaluate all purchases, especially those from out-of-state vendors, to determine whether a sales or use tax liability is owed could result in substantial interest charges and penalties if the law firm is audited by the Department of Revenue. Read how Wisconsin’s sales and use tax rules apply to many common law firm purchases and what your firm should do if selected for audit. Many Wisconsin companies have operations in China or do business with companies based in China. United States companies have been litigants in a variety of cases – from antitrust litigation involving retail price maintenance to product liability, trade disparagement, unfair competition, and contractual disputes – and numbers of cases are trending as the Chinese market matures. Learn about the differences between the Chinese and American legal systems to prepare you for litigation in China. The State Bar – Cui Bono? The State Bar offers something for every member, says Patrick Fiedler, including professional ethics guidance, practice management resources, and legal research tools. George Brown reminds you to fully complete the State Bar dues and Supreme Court assessments form, coming to you shortly. Analysis of the court’s opinions overall sheds light on the path it is traveling, says Tom Kamenick. Attorneys must reveal to clients medical issues that affect their ability to provide competent representation, says Dean Dietrich. Tom Watson answers questions about malpractice risks involved when using experts, expert reports, and expert advice for your clients. Nerino Petro says tablet devices are now ready for primetime use by lawyers. Are Lawyers Smarter than Frogs? Gary Bakke says even successful lawyers should make way for the profession’s innovators.